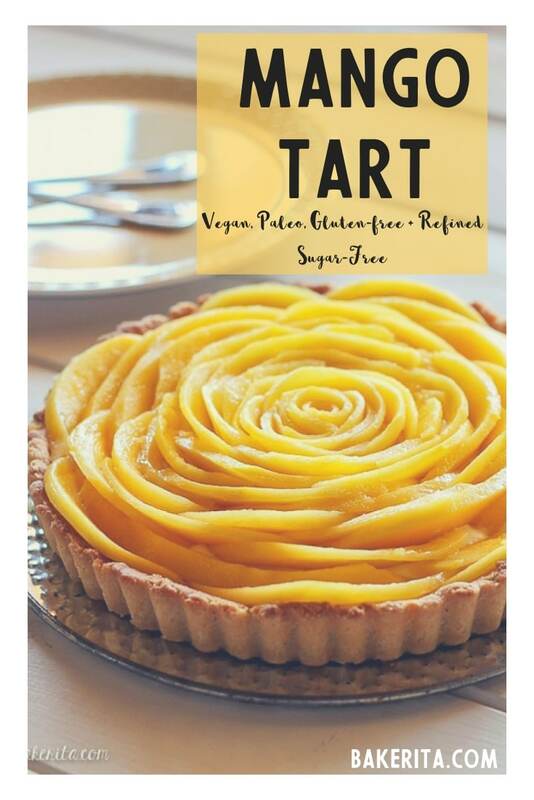 This Mango Tart uses fresh, ripe mangos and coconut cream to make a delicious dessert that’s gluten-free, Paleo-friendly, refined sugar-free, and vegan! The recipe includes step by step photos for how to make a beautiful mango flower. I’m back in America! I’ve spent the past week acclimating to the (gorgeous) San Diego weather, getting some sun on my skin (that it had seriously been missing for the past six months), and of course, getting reacquainted with my kitchen! For real though guys – you have no idea how good it feels to be baking again. I miss London and having so many adventures terribly already, and I’ve barely been home a week, but it also feels so so nice to be back with my family, with all of the comforts of home! My list of recipes to make had been getting extraordinarily long through my baking hiatus, and I still have tons more recipes I need to make/perfect/share with you guys! 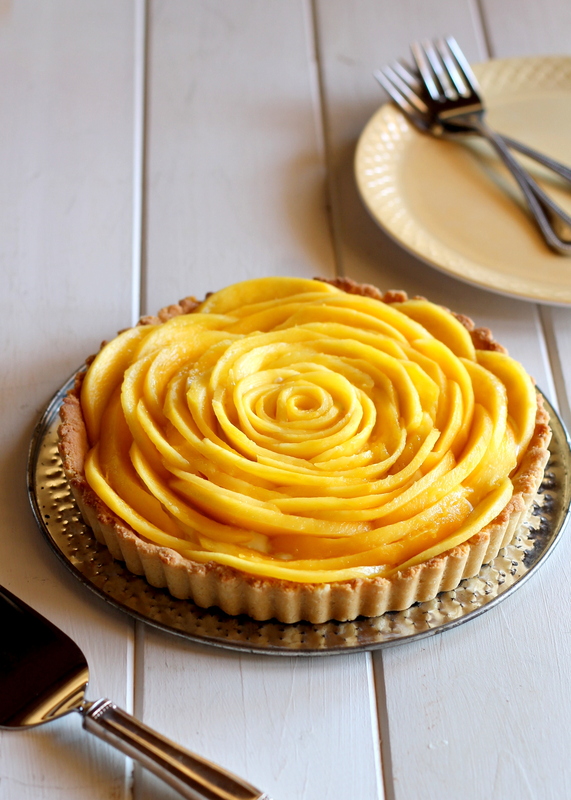 This Mango Tart though, well, it has been on my to-do list for ages, and the recipe came out perfectly the first time I made it. If you’re from North County San Diego, you’ve likely had the Mango Tart from Pasta Pronto (now Urban Pi) in Del Mar. That tart is soooo goooood, with the juiciest mangos you can imagine, a wonderfully light creamy filling, and a crunchy delicious crust. I needed to replicate it, and with this tart, I’ve done just that – but made it a bit healthier. 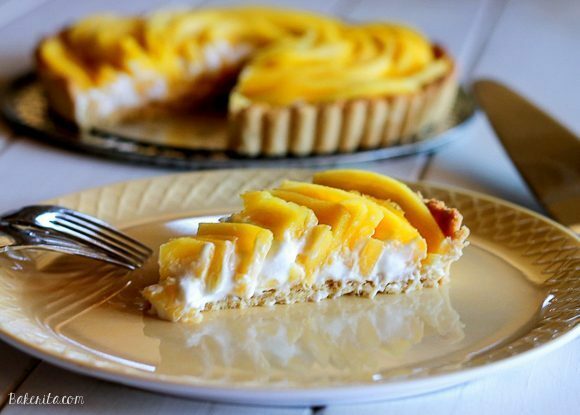 The key to this tart is firm, sweet, perfectly ripe mangos. After all – they’re the star of the show. A subpar fruit will make a subpar tart – just saying (though the crust and filling will still be delicious!). I know it looks super intimidating to put together, but I promise, it’s really not! 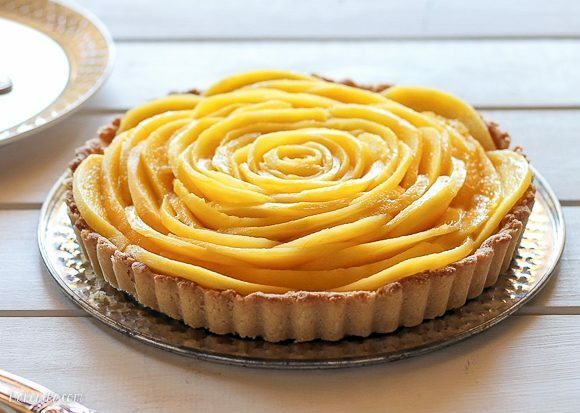 It just takes a few minutes to lay the thin mango slices around and inwards towards the center, and makes a gorgeous, incredibly impressive, and amazingly delicious tart. The best part?! Besides being gorgeous, and delicious, it’s also healthy! The crust is my favorite almond coconut crust that comes together in minutes with a wooden spoon and just a few ingredients. While the filling does require a bit of forethought with putting the coconut milk in the fridge overnight, the actual active time is just a few minutes. The whole thing is gluten-free, grain-free, vegan, Paleo, and soy-free. As for the creation of the mango flower, here’s some photos to show the process – I also hopefully explained it decently in the instructions, but if you have any other questions – ask me in the comments! Preheat oven to 350ºF. In a food processor, pulse together almond flour, salt and shredded coconut until finely ground. Melt together coconut oil and maple syrup and add to almond flour and coconut mixture. Pulse until coarse crumbs form (dough should clump together when squeezed with fingers). Remove can of coconut milk from the refrigerator and flip it upside down (this will cause all the liquid to be at the top). Open the can, and pour the coconut water into a separate bowl (you can save this for smoothies!). You will be left with the coconut cream in the bottom of the can. Scoop this out and transfer to another large bowl. With a hand mixer or whisk, whip the coconut cream until fluffy. Add the maple syrup and vanilla and whip again until combined. Place in the fridge until ready to assemble the tart. 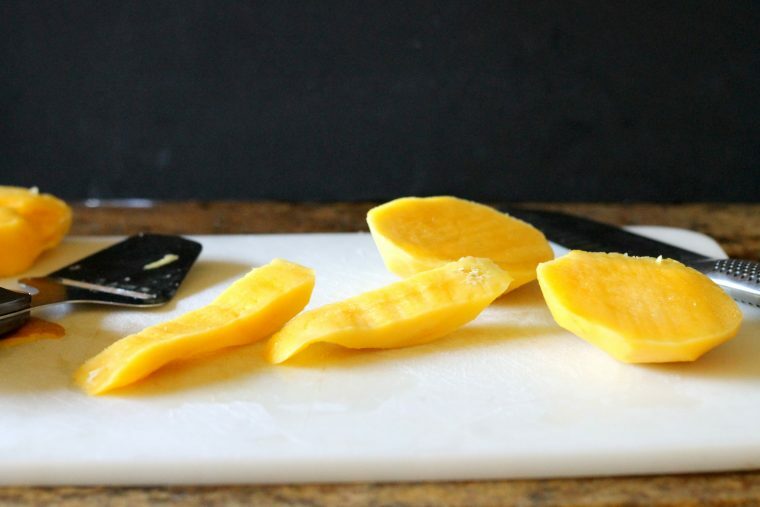 Peel the mangos with a vegetable peeler or a knife. 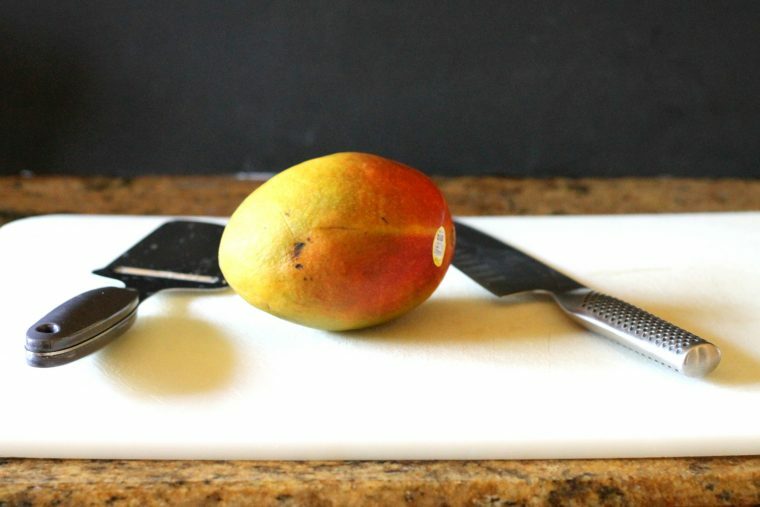 Hold the mango upright on the counter with your fingertips. Position your knife to one side of the center stem and slice straight down, cutting as closely as possible to the seed. Turn the mango and slice off the other "cheek." You will have two big pieces of mango and the flat seed. 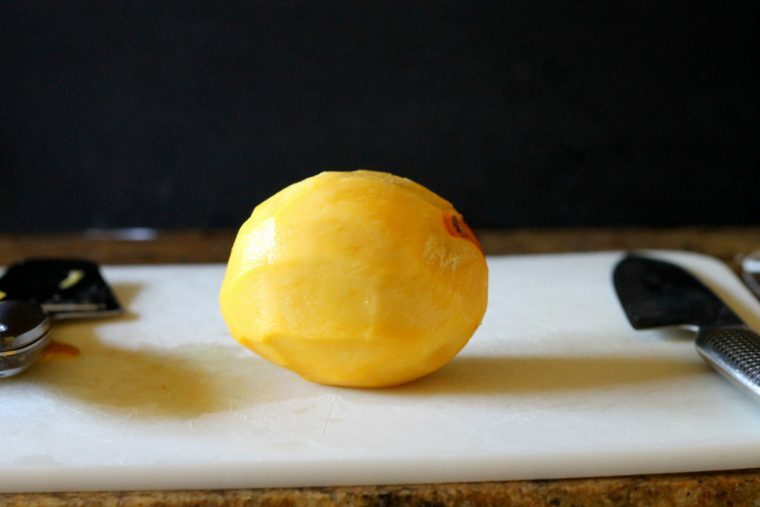 Slice the mango cheeks lengthwise into very thin strips. Remove the whipped coconut cream from the fridge. Spread it in an even layer over the completely cooled crust. Starting with the longest strips of mango, place the slices around the edge of the tart. Repeat, working your way in, slightly overlapping the rows. 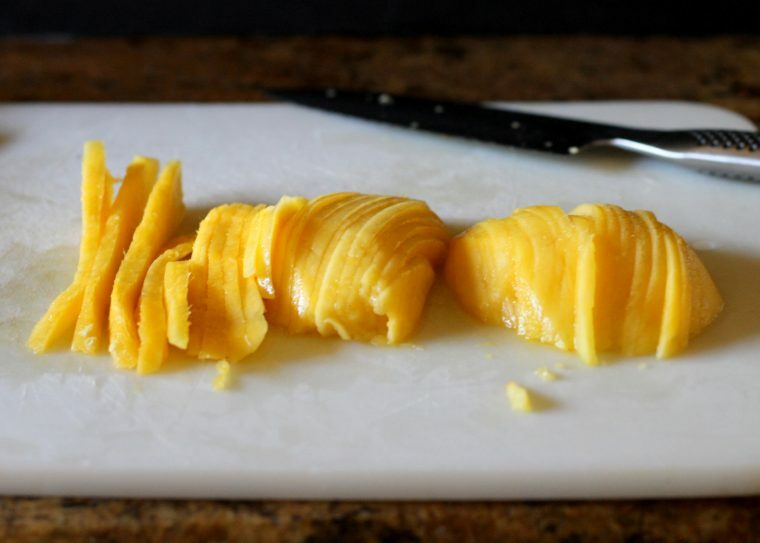 When you reach the center of the tart, roll one mango slice into a curl and place in the center. Keep refrigerated until serving, and enjoy! Enjoy this recipe? Check out some of my other tarts below! It’s so hard to adjust back to real life, especially when you’ve been gone as long as you have! This tart is seriously so incredibly beautiful, I’d have hard to time eating it, I’d just want to stare at it! ha! Welcome back! This sounds amaaaaazing Rachel! I am going to try it tomorrow! Welcome home,Rachel! I know how exciting travelling can be, but also that there’s no place like home. I’m still living out of a suitcase but looking forward to that ‘settling at home’ feeling. As for this tart … wow! It looks so beautiful and you explained perfectly how to put it together. And it’s healthy, too. What more could you want from a dessert?! Welcome home Rachel! I’m so glad you enjoyed yourself and are settling back in to your home. 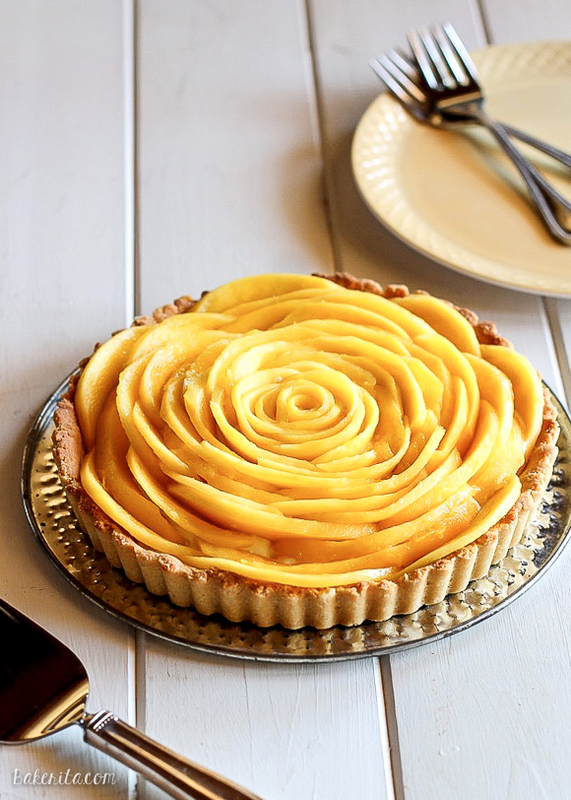 This mango tart looks divine. I’m on a fruit cake over at my blog and just mangoes haha. They are found everywhere here in Jamaica and of course coconuts too so I can’t to try this out! It is absolutely beautiful. UGH ignore my first comment please! I was reading Beth’s own and wrote her name hahaha please delete it! This tart is stunning! And with mango and the coconut cream!! I love it – two of my favorites! So perfect for summer too : ) And welcome back! I adore mango and this is stunning! I am making asap! I love how such simple ingredients come together to make such a breathtaking presentation! Thanks Annie, I hope you like it! This is BEAUTIFUL Rachel! I noticed it in the top row of Foodgawker this morning, and thought it looked like the perfect summer dessert. So neat that you commented on my blog today! Serendipity! Welcome home from London! Sounds like you’ve had a fun past couple months. It is always great to come back home after a trip and get settled back into a routine. I’m in California too! Up by San Francisco. But my husband is going down to San Diego in 2 weeks for a bachelor party, lucky guy. This tart is beautiful. I’ve never made anything with Mango… I’m thinking of taking this to a BBQ on the weekend… Do the mangoes go brown if the tart sits for a couple of hours? I’ve been wanting to make this for a long time. Must make it now after seeing your post! And I love the version at Urban Pi. 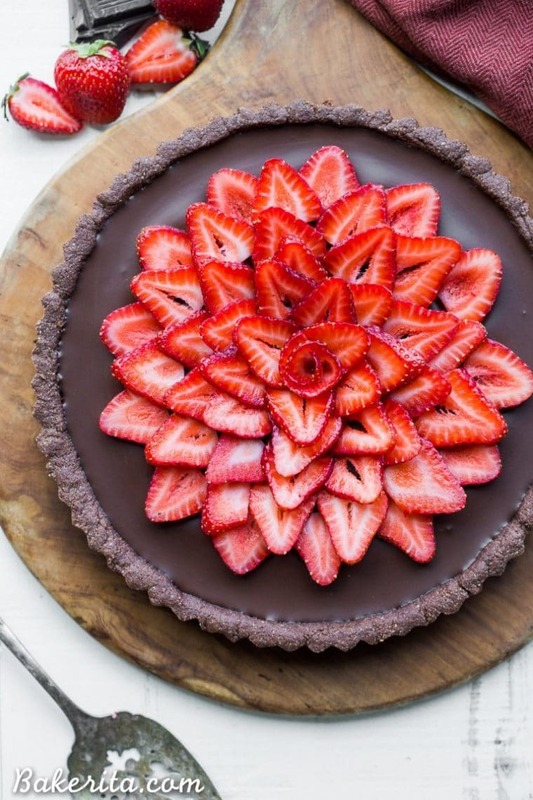 This might just be the most gorgeous tart I’ve ever seen. I’m seriously so impressed with how you laid out the mango slices. 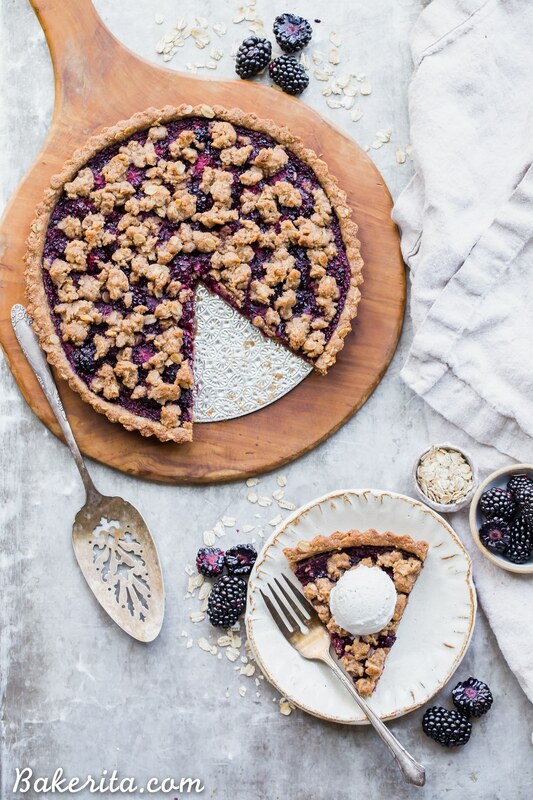 This tart is going on my summer baking list, stat! This tart is SO gorgeous!!! I’m loving it. And welcome back! I want to go back to London so bad! I am making this ASAP! love the way you arranged those mangoes! Beautiful! This recipe just screams summer to me! I love it! Yay for an AWESOME trip! But at the end of the day nothing beats home! It’s the best feeling ever to come back to a familiar surrounding! This tart looks sooooo delicious! I love how healthy it is! 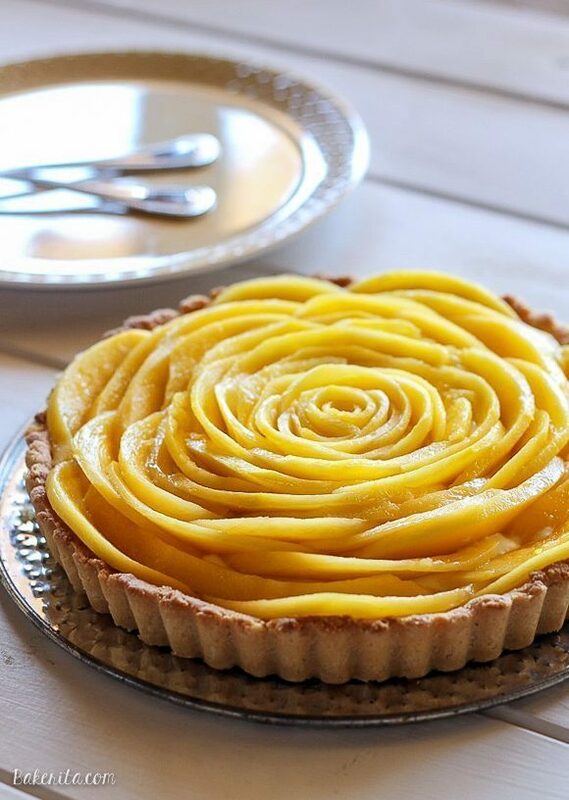 Mangoes are one of my favorite fruits and since the mango season is on in full swing here, I can’t wait to make this tart! 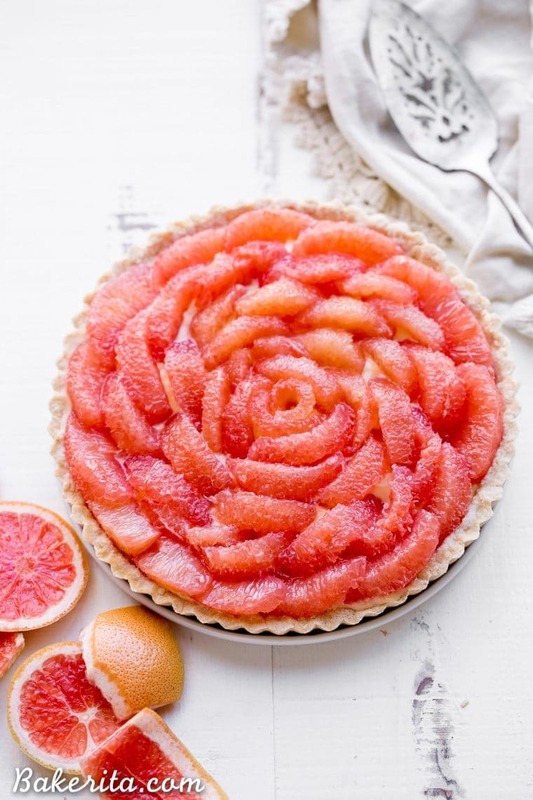 Wow, this is gorgeous, looks to be the perfect summer tart! What a beautiful tart! I hope you enjoyed London. Thank you for this gorgeous recipe! I made this tart, it was quick, easy and turned out just as pretty as yours, which rarely happens when I try recipes from stylish bloggers like yourself. I’ll be making this all summer long for my paleo and gluten-free guests! Oh I’m so glad that you liked it, and that it turned out well!! The only time I’m stylish is when it’s deceptively easy :) Thanks for letting me know how it turned out! Lovely tart! I will be sure to make this one. The beauty and the healthy ingredients make it a win/win recipe. Hi Kathy, you could definitely make the crust ahead of time and keep it in the freezer, but I would hold off on making the filling and arranging the mangos until closer to serving time. The mangos and filling wouldn’t have the same consistency if you froze them and then defrosted. You could finish the tart the day before serving and store in the refrigerator overnight, but I wouldn’t recommend any farther in advance for the best results. Could I use peaches instead of mangos? Hi! I love your recipe! do you think the crust can be filled with something like custard? then baked again? Hi Nadj, I haven’t tried it so I can’t confirm, but definitely don’t bake it with the mango on top. Let us know how it works out for you! This looks great! Rachel, is there any other non-nut based flour that can be substituted for the almond flour? Hi Dori, thanks so much! You could try using oat flour if you aren’t Paleo, or ground up sunflower seeds. Hope you like it! Hi Rachel. You could use sunflower seed flour (which is easy to make yourself in a food processor or blender) or substitute with an equal amount of oat flour. Hope you and your son like the tart! I know this tart well, I lived in the north country for 14 years. Since we moved my husband n myself have miss this decadent dessert. Thank you so much for sharing, making one today. Will let you know how it turns out. Awesome! I hope you and your husband enjoy the tart, Phyllis. I made this for a friend’s bday and it was a hit. Hi Sabrina, I would guess that your coconut cream was not thick enough if it seems runny (I’m assuming your referring to the coconut filling). Make sure to only use the coconut cream from the coconut milk, not the water. Trader Joe’s sells just coconut cream in a can as well! Hope this helps. Thank you. I drained the water but maybe it didn’t have enough fat. I’ll try the kind at trader Joe’s. Thanks so much. Hi! I’m planning to make this this weekend but only have unsweetened coconut flakes instead of shredded coconut. Do you think this will work the same? The flakes seem a little dry. Hi Clara – the flakes will work, but I would pulse them a couple of times in a food processor to make them a bit smaller. This will help the crust hold together more easily. Hope you enjoy the tart! What a fresh dessert! I used coconut flakes and pulsed a few more times and this worked very well. Hardest part is cutting the mango, but that has always been a challenge for me. Still was beautiful. Wonderful recipe! This tart is wonderful! It was fun to make and turned out perfectly. I love that it is sweet but not overwhelmingly so. A beautiful recipe; thank you! I was wondering if you can use a different flour and oil. Im in a place where I cant get these ingredients. Thank you! It looks delicious. Hi Svatia, I haven’t tried this recipe using a different flour. For the oil, you could use melted butter instead. For the flour, any other nut seed flour would work. You may want to use a different crust recipe that uses ingredients you have on hand for the best results. Enjoy! When you say to include “vanilla” is that vanilla ice cream? Can’t wait to try this! Hi Sofia, no, that refers to vanilla extract. Sorry for the confusion! Enjoy. I”ve made a brave attempt to make this one,measured every ingredient precisely, but my crust turned into crumble with the most gentle touch. what have i done incorrectly? perhaps it needed more oil? or lower oven temperature? Hi Lera. When you’re working with almond flour, the most common cause of that is that the almond flour is too coarse a grind. If it’s too coarse, it won’t stick together well and will crumble, like you described. I like using Honeyville and Bob’s Red Mill almond flour. However, you could definitely try using an extra tablespoon or so of oil or maple syrup to get it to hold together a bit better too if you don’t want to buy new almond flour (I know it’s expensive). I hope this helps! Good luck, and let me know if you have any other troubles or questions. Enjoy! Hi just wanted to stop by and thank you for the inspiration. Every year here on the isle of wight we get abandoned at work by colleagues attending the isle of wight festival. To cheer ourselves up, we core few workers indulge in a 3 day “Feastival”. This year, after many years as a veggie I have gone dairy free and was worried that I might not be able to meet the strict yumminess requirements for my submissions. However, after seeing your beautiful tart, I decided to make a version with a dark chocolate/soya cream ganache and a dairy free biscuit base. What a wonder – everyone thought it was divine. Many thanks – I will be making again!! I am planning to bring this to a BBQ on Saturday night (because it looks like a work of art!!). Will this keep well in the fridge for 3 – 4 hours before serving or will the mango make the cream run/get liquidy? That looks absolutely delicious! Mangoes are amazing in Australia right now, I’m gonna have to try this recipe! I made this twice now and both times came out absolutely amazing. I used 1tbs of agave syrup and that seems to be just good enough. It’s not extremely sweet light fluffy coconut filling. The almond flour crust came out just a little too salty, but I might have over done it with the salt. I say 1/2tsp. But other than that the crust was nutty and the shredded coconut gave it an amazing light crunchy texture. Any topping would go great with this tart filling, I’ve used mango twice now. Next time I want to sweeten the filling a little more and use a different topping. So thrilled you’re loving it Angela, thanks so much for sharing your feedback.